1. Theodor Herzl was born Benjamin Ze’ev Herzl in May 1880, in Pest, Hungary, the younger child of German-speaking, assimilated Jews. His upbringing, as he described it, was “thoroughly emancipated, anti-traditional, secular.” He was a “would-be German boy” who viewed religion as uncivilized. Indeed, there was a time when he thought the best solution to the “Jewish problem” in Europe would be mass conversion of the Jews – but this was before the Dreyfus Affair. 2. Following the death by typhus of his sister, the family moved to Vienna, where he studied law at the University, encountering anti-Semitism. After a brief legal career, he became a journalist and devoted himself to writing. He authored some plays and became a correspondent for the Viennese newspaper Neue Freie Press, where he also served as literary editor. In 1891, he became the Paris correspondent for the paper. 3. 1895 was a watershed year for Herzl. The Dreyfus Affair broke, and he followed the trial for his paper. At the same time, in Vienna, an anti-Semitic demagogue named Karl Lueger rose to power. Herzl was converted to a new view of European anti-Semitism: that it could not be overcome by any means, only avoided by the establishment of a Jewish state. 4. His 86-page pamphlet, Der Judenstaat (The Jewish State) came out in early 1896 to immediate acclaim by existing Zionist groups such as Hovevei Zion; and to vilification by establishment Jewry who either felt their own assimilation threatened by it or thought that Herzl’s ideas went against God’s will. 5. Having visited Baron de Hirsch, members of the Rothschild family, Jewish architect Oskar Marmouk and journalist Friedrich Schiff with no great result, he proceeded to wangle “direct and publicly known” meetings with heads of state in order to legitimize his standing with his fellow Jews, so that they would “believe in me and follow me.” He met with the Grand Vizier of the Ottoman Court, offering payment by Jews of the entire Turkish foreign debt in return for Palestine as a Jewish homeland under Ottoman rule. Five years later, he met with the Sultan, who turned down the offer. He met with Bismarck. He met with the Grand Duke of Baden, uncle of Kaiser Wilhelm II. 6. He had popular support. In July 1896, in London’s East End, an enthusiastic crowd greeted him at a mass rally. The following year, he founded the Zionist newspaper Die Welt, and with his friend Max Nordau planned the first Zionist Congress [see my blog post of June 19]. It was the very first inter-territorial gathering of Jews to be held on a national, secular basis; and it brought together about 200 delegates, mostly from central and eastern Europe, with a handful from western Europe and from the United States. They elected him President of the organization, a position he held until his death. 7. More visits: In 1898, he went to Palestine, coordinating his trip with that of Kaiser Wilhelm. They met twice, but Wilhelm dismissed his entreaties with anti-Semitic remarks. 8. He was deeply affected by the Kishinev pogroms of 1903, of the desperate condition of Russian Jews, and continued to seek the support of world leaders for a Jewish homeland. Through connections with the British government, he negotiated with Egypt for a charter to settle Jews in the Sinai; he sought the Pope’s aid, but he was denied – as long as the Jews continued to deny the divinity of Jesus. 9. Finally he received an offer from the British to facilitate a resettlement of a large number of Jews in East Africa, where they would have an autonomous government under British suzerainty. After traveling to Russia to obtain the approval of that government, he presented the “Uganda Program” to the Sixth Zionist Congress in Basel in August, 1903. A motion to investigate the offer further was carried by a vote of 295 to 198 with 98 abstentions (the Russian delegation walked out in protest.) The plan was rejected at the Seventh Zionist Congress in 1905. 10. Herzl’s last literary work, Altneuland (Old New Land), a novel, was published in 1902. In it, he envisioned what would be accomplished by 1923 in a state combining Jewish culture and European heritage. The government he imagines is not a religious state, though the Temple has been rebuilt. Economically, he foresees a “third way” between capitalism and socialism. Socio-politically, he sees no conflict with the Arabs; and women have political equality. 11. He died on July 3, 1904, of illness variously described as a heart ailment, cardiac sclerosis and pneumonia – all of which may be true. “Greet Palestine for me,” he told a friend. “I gave my heart’s blood for my people.” In 1949, his remains were moved from Vienna and reinterred in Jerusalem on Mount Herzl. 12. How to sum up his contribution in one bullet point: having offered a reassessment of the Jewish problem as a national problem requiring an international political solution, Herzl initiated diplomatic steps toward that end; and having proposed a practical program for collecting funds from Jews around the world (the blueprint for the Zionist Organization), Herzl strengthened the ties of Jews around the world through his indefatigable efforts traveling, writing, speaking. Theodor Herzl has been commemorated on Mount Herzl; in the Herzl forests at Ben Shemen and Hulda; in the Herzliya Gymnasium, the first Hebrew language high school; in the city of Herzliya; and in neighborhoods and streets all over Israel. A note to the followers of this blog: Well, I’ve done it, tackled Herzl, a task and an opportunity that I’ve been ducking for half a year. I deserve a break, so in honor of Independence Day, and in commemoration of the anniversary of Herzl’s death, I’m taking next week off. Look for a new post on July 10. 1. Max Nordau was born Simon (Simcha) Maximillian Sudfeld in Pest, Hungary, in July 1849. His father was a Hebrew poet. 2. He studied to be a physician, earning his medical degree from the University of Budapest in 1872. In 1873 he changed his name to Max Nordau (more about this below). He served for six years as an Austrian military surgeon; then, in 1880 he moved to Paris, where he would spend most of his life. 3. He considered himself fully assimilated. “When I reached the age of fifteen,” he wrote, “I left the Jewish way of life and the study of Torah….Judaism remained a mere memory and since then I have always felt as a German and as a German only.” Hence the name change. 4. Then came the Dreyfus Affair. In Paris, he attended the trial, reported on it, and witnessed a mob screaming, “Death to the Jews!” He concluded that anti-Semitism was universal. And therefore, that Zionism was a necessity. 5. 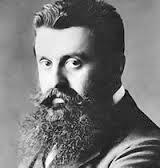 Theodor Herzl was in Paris working as a correspondent to a Vienna newspaper. Nordau, as his friend and advisor, was the one who convinced Herzl of the need for democratic assemblies in the Zionist movement. Nordau organized the first Zionist Congress, held in Basel in 1897; there would come to be 11 in all. 6. Nordau had already achieved fame as an intellectual and essayist, who wrote on contemporary art, society and politics. His works were widely translated, and his involvement lent the congress a certain vogue. He spoke second at the conference, after Herzl, offering statistics that documented the miserable condition of Eastern European Jews and then expressing his belief in the future establishment of a democratic nation-state. 7. In 1898, at the second Zionist Congress, he coined the term “muscular Judaism” to describe the discipline and agility of a stronger, more physically assured Jew – replacing the physically weak, intellectually sustained stereotype. Though he railed against such characterizations, he himself believed that the Jew had a special genius for politics. 8. He supported the Uganda Plan, coining the term “night shelter” to describe a temporary solution to the precarious condition of so many Eastern European Jews. 9. He is best known today for his book Degeneration (1892), an attack on what he considered degenerate art. Always controversial, other works of social criticism included The Conventional Lies of Our Civilization (1883) and Paradoxes (1896). He died in Paris in January 1923; three years later, his remains were moved to Trumpeldor Cemetery in Tel Aviv. You’ll find Nordau Street in Tel Aviv not far from the port. In Jerusalem, Kikkar Nordau is located near the central bus station. Look for him in Haifa, too. 1. Y.L. Gordon was born in 1831 in Vilna. His parents were well-to-do hoteliers. He studied Torah and Talmud, and he began writing Hebrew poetry at a young age. 2. He became a teacher in some of Europe’s major yeshivot, and his poetry began to be widely read. “The Love of David and Michal” (1856) was noteworthy for its attempt to voice the concerns, feelings and even the sexuality of a woman. Indeed, much of his poetry used biblical themes to espouse enlightenment values. 3. More evidence of his enlightenment philosophy appears in his “Fables of Judah” (1859), which included stories of Aesop, LaFontaine and Ivan Krylov. 4. Two of his most famous poems urged Jews to partake in Russian and western culture while remaining committed to Jewish culture. His most famous line – from “Awake, My People” (1863) – was widely quoted, becoming a rallying cry for the Haskalah (secularist) movement: “Be a man in the streets [outdoors] and a Jew at home [in your tent].” In “The Tip of the Yud,” (where Yud refers to the Hebrew letter) Gordon called for the Jewish woman’s liberation from traditional roles, so that she, too, could benefit from enlightenment ideas. 5. Gordon’s style was modern, rather than biblical, though it was full of references to biblical and rabbinic words and thought. He wrote mostly in Hebrew, only occasionally in Yiddish, viewing Yiddish as a language of degradation. 6. In 1872, he moved to St. Petersburg, where he served as secretary of the St. Petersburg Jewish community and the main branch of the Society for the Promotion of Culture Among the Jews of Russia. His fervor for western ideas brought him into conflict with Orthodox Jewry. Denounced to the Russian authorities for alleged anti-tsarist activities, he was sent into internal exile within Russia. But exile did not stop him from writing his anti- traditionalist, pro-humanist verse. His “King Zedekiah in Prison” is one example from this period. 7. 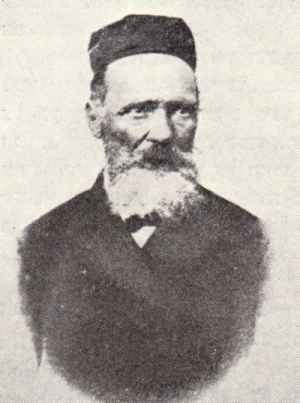 After his return to St. Petersburg, he became editor of HaMelits, the most important Hebrew newspaper of the time. In his daily columns, he continued to promote enlightenment ideals, urging the translation of general literature into Hebrew and the education of Jews in Russian (and other languages) as well as Hebrew. 9. He died in 1892, having been repudiated by his friends, who no longer subscribed to his liberal, pre-nationalist ideology. He died believing that “our spiritual deliverance” had to be a precursor to the Jewish physical return to Zion. 10. He is remembered as a poet who projected the image of a prophet, a forerunner of Bialik. You can find Gordon Street in Tel Aviv off Rabin Square, running between the sea and the square. 1. Pines was born in 1843 in Ruzhany in what is now Byelorussia. The family were prosperous merchants and Torah scholars. As a child, he studied both traditional Jewish subjects and foreign languages and science – a broad curriculum for his time and place. 2. Perhaps as a result of his education, he believed that Jewish life could be reformed without destroying the sanctity of religious belief and practice. These ideas were both influenced and expanded upon by Ahad Ha’am [see my post of April 24]. 2. In 1877, at the age of 34, he was asked to serve in Palestine as a representative of the London-based Moses Montefiore Testimonial Fund. He arrived in Jerusalem in 1878. 3. After looking into the spiritual, cultural and economic life of the Jews in Palestine, he advocated building an agricultural settlement, laying out new quarters for Jews in Jerusalem, and creating a variety of artisanal and industrial projects. 4. The neighborhoods of Mizkeret Moshe, Ohel Moshe, Yemin Moshe and Zichron Moshe, all in Jerusalem, were established as a result of his efforts. 5. A political conservative, he wrote articles and pamphlets that were later to be adopted by the emerging Mizrachi party. 6. He became friends with Eliezer Ben-Yehuda [see my post of February 6] when Ben-Yehuda made aliyah, and they worked together on the revival of Hebrew as the spoken language of the Jews in Palestine. 7. He worked with young Russians to establish the settlement of Gederah and was its first patron. He continued trying to further the development there of artisans, craftsmen and smiths. 9. One tale told about him is that he sold his wife’s jewelry to secure the renewal of Petach Tikveh after the settlement was destroyed. 10. He died in 1913. Kefar Pines, a moshav in the Sharon Plain, was named for him twenty years later. You’ll find Pines Street in the Neve Tzedek area of Tel Aviv. Note: in Hebrew, Pines is not pronounced like the tree. Which is, of course, why I’m writing about Pines (yes, I’m about twelve years old).